There are many different reasons and different kinds of imperfections that may be keeping you from a confident smile. If your teeth are slightly crooked because you were never able to get braces as a child, or if your teeth are small and misshapen, these issues can often keep patients from smiling. It’s also common for years of wear and tear to dull a smile, and yellowing teeth is a common pain point for patients when it comes to the esthetics of their smiles. One of the best things about veneers is that they can solve a huge variety of cosmetic issues with your teeth, and can be applied in just 2-3 appointments. If you aren’t happy with your smile, come in for a consultation with Dr. Priti Naik right away and learn more about your options! Severely damaged teeth usually require restorative treatment like a dental crown. But if you have minor chips or damage to your teeth, veneers may be the best way to cover them up, protect them, and restore the natural beauty of your smile. 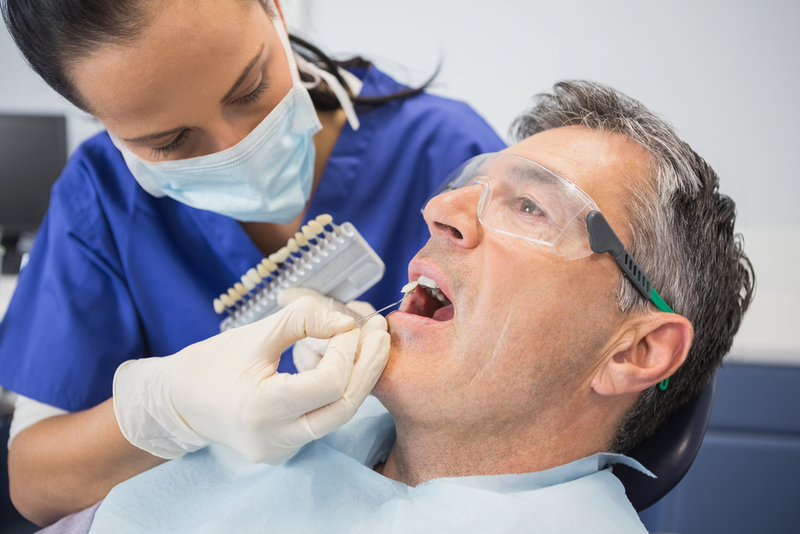 Internal stains can happen because of root canal therapy, an infected tooth or a gray metal-amalgam filling. Some antibiotics can also cause internal staining, as can overuse of fluoride. Internal stains can’t be treated with teeth whitening, but they can be covered permanently with porcelain veneers. Porcelain is also a non-porous material, so you’ll never have to worry about staining again. Worn-down teeth can be caused by the natural aging process. However, dental issues like bruxism can also cause the teeth to be worn down prematurely. Acid reflux (GERD) can also cause the teeth to become worn due to high concentrations of stomach acids in the mouth. Veneers can cover up worn-down teeth, protect them from further damage, and ensure that your smile looks natural and beautiful. Veneers are a great way to cover up gaps in your smile. If you have major gaps between your front teeth, and you feel self-conscious about how you look, veneers can be used to fill in these gaps and give you a better smile. Interested in Veneers? Schedule a Cosmetic Dentistry Appointment Today! If any of these common dental issues have been keeping you from smiling, veneers may be right for you! The smile of your dreams is within reach at Priti Naik, DDS. Read our patient testimonials to hear success stories from past patients. Call us today at (703) 288-1800 to schedule your appointment and learn more about your cosmetic dentistry options, or come to our office at 8230 Boone Blvd. #320, Vienna, VA 22182. We hope to see you soon, and we can’t wait to help you get the smile you’ve always wanted.